When Stockholmers want to get away from it all, they head to their very own desert island, if they've got one, amongst the thousands in the nearby archipelago. Bjorn Akerlund provides getaways for the unfortuntes who don't have their own, or who want a very private place for a conference. When faced with that classic tricky question of what three things he'd take to a desert island, Bjorn Akerlund shrugs, not really knowing what to answer.
" Funny question" he smiles before hesitating, " I guess a fishing rod, some music and a yacht to escape!" Hard to believe he'd even need to rack his brain: having an island of his own in Stockholm's archipelago, Akerlund certainly knows the must-haves when living in a home surrounded by the sea. The approach to Stockholm by sea is through an archipelago with about 30,000 islands, islets and skerries stretching over a hundred kms north and south along the south-eastern Baltic coast. 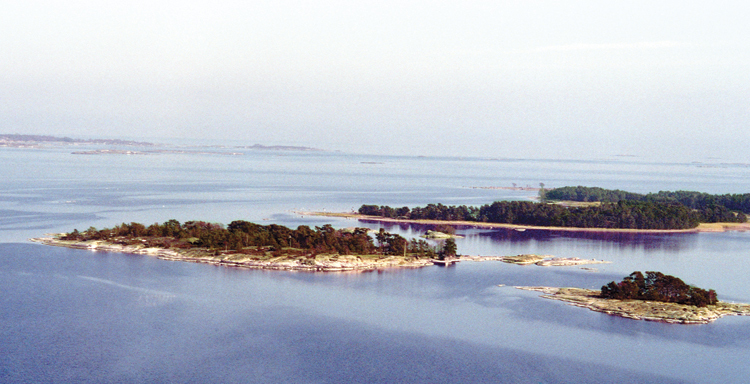 About 1,000 of the islands are inhabited, with about 50,000 cottages, and nowhere is more than about 2 hours from Stockholm. Most of Akerlund’s guests are top business executives who want to give their clients an original experience. After a day of meetings and talks in town, a fifteen-minute helicopter ride will whisk you to a secluded paradise. Expect a breathtaking landscape and a warm welcome from the always-congenial Akerlund and his wife. Before dinner why not relax, and work up an appetite? Start with a walk around the island, which will take you all of fifteen minutes. It is a good way to enjoy the gorgeous scenery of the flat-as-a-pancake rocks, as well as a reminder that you are, indeed, surrounded by water. Raskgar Island is also the perfect place to indulge in that must-do Scandinavian experience: the sauna. Lie back and let the work-pressure steam off. If you’ve always wondered whether you could fend for yourself on a desert island, then Akerlund provides fishing rods so you can put your survival skills to the test. Rest assured: if you find out that your fishing expertise is limited, your host knows what he’s doing and he will already be cooking his catch of the day for you. “Food is not complicated here but it is as fresh as it can be,” says Akerlund. “All the fish I serve, I catch them myself.” “The simpler, the better” seems to be the motto. Traditional local pastries, cinnamon rolls or kanelbulle, are served to finish. A big room is available if you still have the energy for more business talks. Akerlund’s business background helps him understand the specific needs of his corporate clients. “I know what is needed as I’ve been on the other side of the table,” confides Akerlund. “Usually people coming here invite their clients so they can all get to know each other better. This environment is perfect for fostering a creative atmosphere. It’s like the Swedish painters 150 years ago who came to the archipelago to find inspiration.” The atmosphere is certainly creative, as well as relaxing and enchanting. This evening is the perfect antidote to reality. Plus if you want the experience to last a little longer, there’s a guesthouse that sleeps up to fifteen people. Be warned: if you stay any longer, you might have a tough time going back to the mainland.